The material of the anti-static brush is the special static PP plastic, the bristle is made of anti-static PA plastic threads, and it is available to order different specification in different height and hardness as clients’ requirements. Product Information: The material of the anti-static brush is the special static PP plastic, the bristle is made of anti-static PA plastic threads, and it is available to order different specification in different height and hardness as clients’ requirements. It is widely used for washing different components and PCB board, the electrostatic charge can be released to the ground. 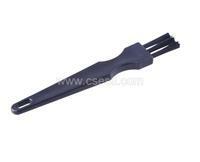 And the elastic bristle will not damage the components ,PCB board and other products. There are one row and three holes of the brush. Application Fields: LCD products manufacturing, LED products manufacturing, electronic products manufacturing, magnetic head products manufacturing, chip products manufacturing, telecommunication products manufacturing, computer products manufacturing, food products manufacturing, medicine products manufacturing, semiconductor products manufacturing, and any other field of production with requirement about anti-static and purificatory grade.